Originally previewed during February&apos;s unveiling of the Energy Boost, the adidas Springblade is finally available. Designed to provide runners with explosive energy, the adidas Springblade features the debut of adidas Energy Blade technology. Replacing a traditional foam midsole, the Energy Blade system utilized on the adidas Springblade is composed of 16 individually tuned, high-tech polymer blades which harness and release energy throughout the stride, helping to propel runners in a forward motion. The blades of the adidas Springblade are also designed to be highly durable and offer consistent performance in any temperature. Meanwhile, the upper of the adidas Springblade is constructed a fully welded, seamless techfit upper for a lightweight fit and reduced irritation. 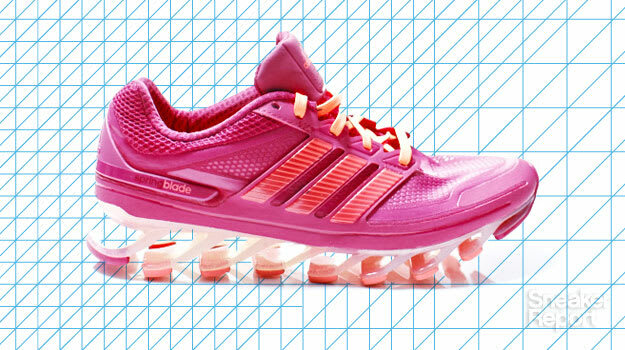 The adidas Springblade is further enhanced by an air mesh tongue and collar, adding ample breathability to the runner. Try out the innovative adidas Springblade today for $180.